Vulnerable Humboldt Penguin – Protected in Chile! 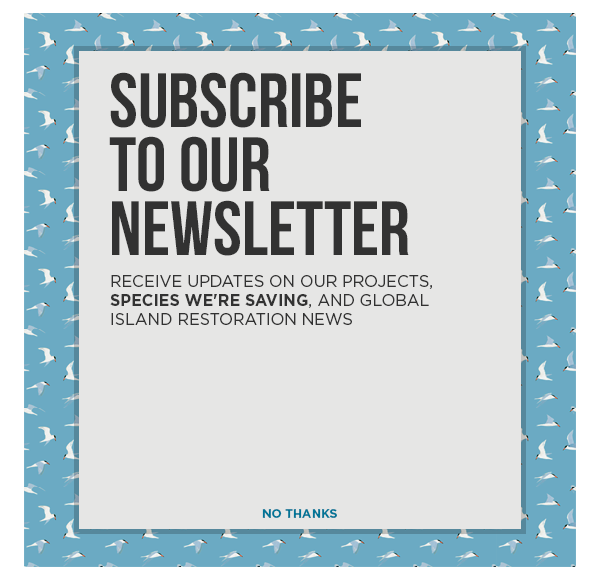 Islas Choros, Chile — The Chilean Forestry Corporation has partnered for the first time with international NGO Island Conservation to restore degraded ecosystems on Chilean islands. On the heels of recent monitoring surveys, the partners today are pleased to announce the successful removal of invasive European rabbits from Isla Choros in the Humboldt Penguin National Reserve, home to the largest population of that penguin species. The invasive European rabbit represented a significant threat to the island’s environment, including the Vulnerable Humboldt Penguin (Spheniscus humboldti) and Endangered Peruvian Diving-petrel (Pelecanoides garnotii), as listed by the International Union for the Conservation of Nature. This, in turn, limited opportunities for nature-based tourism and impacted local residents’ livelihoods. Choros is now free of this invasive pest and the island’s native plants and animals have an opportunity to recover. This project is an essential part of a larger effort to restore the region’s island ecosystems to support local marine and tourism economies, food security, human wellbeing, and the preservation of biodiversity, and the region’s natural heritage. The invasive European rabbit was first introduced to the island by settlers seeking to establish a ready source of meat when visiting the island. When the Reserve was established in 1990 and the settlers moved to the mainland, they left the invasive rabbits behind. Invasive rabbits present on the island were destroying seabird populations by occupying their burrows, increasing erosion, and browsing on vegetation. The partners, with support from local community leaders and scientists, began removing damaging European rabbits in July 2013. At the mercy of rough seas and extreme weather conditions, relentless sun, high winds, and thick fog, the team walked over 2,500 kilometers in their efforts to free the ecosystem from this unwelcome invader. A recent monitoring trip to Choros confirmed that the island is now free of invasive European rabbits. Early observations on the island suggest changes may already be taking place. The scientists observed vast swathes of healthy seedlings, hillsides covered in the Alstroemeria philippii (a rare, native plant species endangered in Chile), and Peruvian Diving-petrels investigating nesting sites in former rabbit burrows. Invasive species experts from Chile, the United States of America, and Australia collaborated closely with CONAF reserve wardens and professionals from across three regions to ensure this project was a success. The generous support of Bell Laboratories, David and Lucile Packard Foundation, National Fish and Wildlife Foundation, Patagonia, and Mitsubishi Foundation for the Americas enabled the most important conservation activity the CONAF Coquimbo Region has implemented since the establishment of the Reserve. It is the first invasive species removal project from a Chilean island within a protected area in over 10 years. “Over 75 similar invasive European rabbit removal projects have been successful since 1912, and the lessons learned from Choros can help guide future island restoration projects around the world,” said Island Conservation’s Hagen. Choros Island is one of only four islands in Chile where the Endangered Peruvian Diving-petrel nests and almost 2,000 Vulnerable Humboldt Penguin pairs depend on the island for nesting. At 301 hectares, Choros is located in the Humboldt Penguin National Reserve, just a short distance off the coast of mainland Chile. The Reserve consists of three islands: Chañaral, Damas and Choros. It is located about 100 km (62 mi) north of La Serena in the Coquimbo Region of Chile and has a total area of 859.3 hectares (2,123 acres). El Pingüino de Humboldt, Protegido en Chile! To provide safe breeding habitat for threatened species on Isla Cabritos by removing invasive species. Isla Cabritos’ native wildlife, particularly its iguana population, is thriving. Invasive species are directly predating on native reptiles by destroying their nests, and damaging critical habitat. The removal of invasive species from Isla Cabritos will safeguard and protect native iguana populations and allow the opportunity for the habitat to recover. The Dominican Republic’s Ministry of Environment and Natural Resources, with support from Island Conservation, the Hispaniolan Ornithological Society, and CABI, is leading an international effort to restore Isla Cabritos by removing invasive species.